Yokogawa advocates a field digital solution that improves productivity and reduces the total cost of ownership (TCO) in customer plants by maximizing the availability of their equipment and facilities. 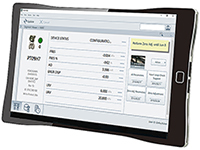 "Field wireless" is a new approach to field digital solutions. Yokogawa has been actively involved in standardization from the beginning and now offers ISA100.11a-based industrial wireless products. 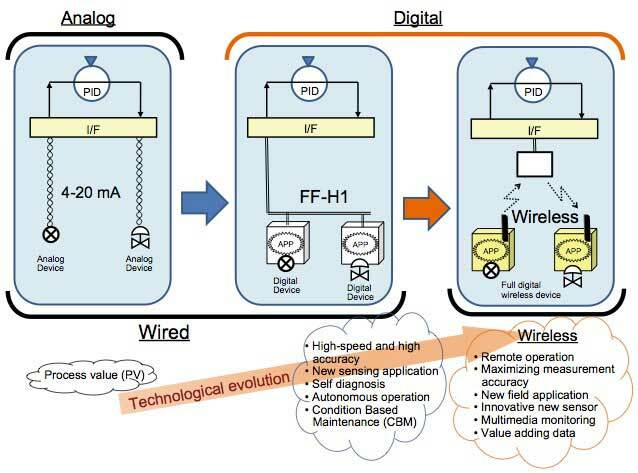 This paper introduces the ISA100.11a standard, a core technology of our field wireless solution, and then describes the features of the field digital innovation that provide new value-added solutions that make wireless technologies work together with existing wired instrumentation and IT technologies. Yokogawa has been leading the process automation industries as one of the pioneers in field digital technologies represented by the FOUNDATION fieldbus™ and Field Device Tool/Device Type Manager (FDT/DTM). It has also participated from the early stages in standardization activities in the technical fields of industrial wireless sensor networks which will be a step toward the next evolution, and has contributed to those industries. In addition, Yokogawa has been developing related products and offering solutions using them. In 2010, Yokogawa released the world's first field wireless devices which conform to the ISA100.11a wireless communication standard for industrial automation1. In July 2012, it launched the ISA100.11a compliant product for large scale plants. As a critical measure for realizing an ideal plant "VigilantPlant" which Yokogawa is aiming, the wireless solution using them was newly added to existing ones, making field devices intelligent, and field digital solutions which can be offered with intelligent field devices. This paper describes the technology of the ISA100.11a standard supporting field wireless communication, and the field digital innovations that provide new value added solutions through the integration and collaboration of the functions of this standard with existing wired instrumentation and IT technology. With recent global economic stagnation, global competition in the process automation industries is becoming intense and operation systems of plants have been changing. Improved quality, delivery and cost performance to satisfy various requirements in the market, and product strategies for better customer satisfaction are required. In addition, the industries are required to deal with CO2 emissions reduction for global warming countermeasures, energy savings through improvement of operating efficiency, and operations to secure the safety of residents around the plant in compliance with various regulations and so on. Under such users' business environments, automation suppliers are responsible for providing customers with solutions so as to secure their global competitiveness, global environmental conservation, and secure and safe operations, while keeping their investment costs at a minimum. The field wireless, which has recently been attracting attention, is expected to bring innovation to many industries. The field wireless, which transmits process data and diagnosis data originating from field devices at sites via radio waves, can drastically reduce various costs and dangerous work tasks related to the wiring work of conventional wired instrumentation. No need of wiring work resolves many constraints, thus increasing the freedom of the installation of field devices and enabling an easy increase in the number of the points to be monitored. Figure 1 shows the features and expected effects of the field wireless. 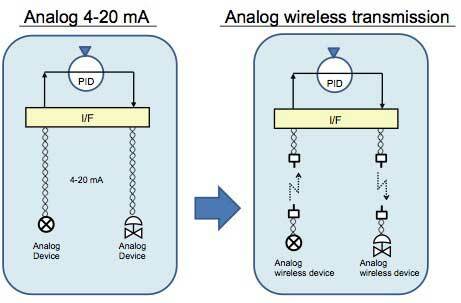 Wireless, with its feature of not needing wiring, is expected to be used in applications such as the mounting of devices on moving objects, temporary installation of devices, changes of monitoring points with ease, and arbitrary addition/removal of devices, which have been impossible in conventional wired instrumentation. Wireless technology has a potential to solve various problems in fields that have been difficult to solve so far. 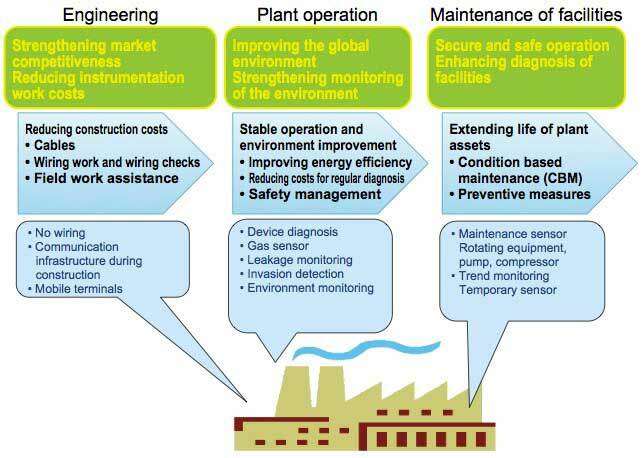 From the viewpoint of the life cycle of a plant, the values shown in Figure 2 can be provided to customers by leveraging the field wireless technology. 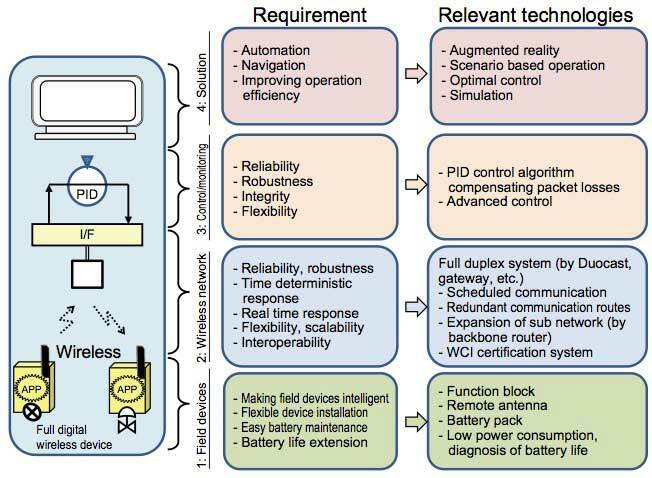 Figure 3 shows the overview of various standardization activities related to field wireless technologies. The activities cover a wide range, including communication protocols, the coexistence management of radio waves to the power supply interface specifications of field wireless devices, and others. These standardization activities are still in progress and Yokogawa has been actively participating in such various standardization committees and has been committed to promoting industrial wireless technologies into all related industries. So far, although customers understand the usefulness of the introduction of wireless technologies into process automation industries, few of them have decided on its introduction because of concern over the reliability and security of the communication and interoperability matters. Because of these concerns, standardization activities for resolving issues of industrial wireless technologies started around 2005, in response to market demands. The ISA100 committee is a standardization organization whose activities cover various wireless technologies in a cross sectional manner for industrial operations2. The committee was formed in 2005 as one of the standardization committees of the International Society of Automation (ISA). The committee works towards developing standards and related guidelines for implementing wireless systems in automation plant site contexts. The committee is made up of over 250 companies and organizations such as: end user companies, wireless technology providers, system vendors, field device vendors, integrators, researchers, consultants, government agencies, and consortiums. Experts in not only automation areas but also a wide range of technical areas covering networking, wireless chips and so on, are participating in this committee from around the world. To satisfy user demands in every market segment, various wireless technologies applied to possible situations of plants are uniformly treated as one of the ISA100 family of standards, and such technologies are discussed in respective subcommittees or working groups. The ISA100 committee developed the ISA100.11a standard as the first project for the ISA100 family of standards, whose official description is "Wireless Systems for Industrial Automation: Process Control and Related Applications." The first edition of this standard was issued in 2009 titled "ISA100.11a-2009" being approved by the ISA100 standards committee. Later, the revised version titled "ISA100.11a-2011" was approved in 20113 and also approved as one of the U.S. national standards by the American National Standards Institute (ANSI) in December 2011. The ISA100.11a standard was submitted as a new work item proposal (NP) to the International Electrotechnical Commission (IEC) and the project in it is working for international standardization as the IEC 62734. A network standard applicable to a wide range of circumstances, covering monitoring applications to control applications, which features highly reliable and time deterministic communications, and high level security technologies. Superior network expandability, owing to open wireless mesh networks (2.4 GHz/IEEE802.15.4) ensuring the interoperability of devices from different vendors and IPv6-based backbone routing. An object oriented application layer equipped with flexibility and expandability which can implement various use cases to satisfy users' requirements. Existing protocols can be used through the tunneling protocol, and analog and binary input function blocks in the ISA100.11a native mode are also supported. 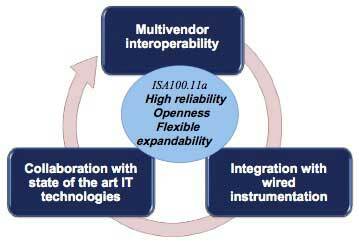 The ISA100.11a is an industrial wireless standard that has been developed looking toward the future and it is one of the critical technical factors for realizing the vision of the field digital solutions which Yokogawa has been advocating. Take a look at digital technologies. Since telephones were invented, wired telephones have been used for a long time. Recently, mobile phones have replaced wired ones and are spreading quickly. If wireless transmission had just replaced the analog wired one as the transmission method of voice signals, our life would not have dramatically changed. Thanks to the digital technologies of a large variety of information services offered via smart phones such as net search, e-mail, and online shopping, though, we can now enjoy a more comfortable life. Likewise, in the process of development of instrumentation technologies, 4-20 mA wired analog instrumentation has evolved to full digital instrumentation represented by the FOUNDATION fieldbus™. As a result, filed devices are able to not only transmit conventional process data but also execute autonomous functions such as transmitting high precision data and self diagnosis information. In wireless instrumentation too, the digital technologies can provide solutions offering more value in addition to that offered in the case of conventional wired instrumentation. To be specific, the digital technologies enable remote monitoring, multimedia monitoring, enhanced precision monitoring by changing from point measurement to planar measurement with a ten times greater number of field sensors, and the like. It is crucial that field devices incorporate intelligent functions. Collaboration between wireless technologies and digital technologies is not simply replacing communication media from wired to wireless as shown in Figure 4, but providing customers with newly value added field data processed by the digital technologies as shown in Figure 5. 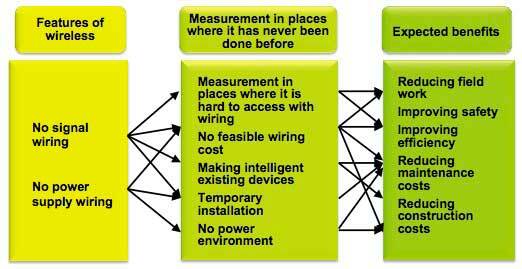 In other words, what is important is not just completely replacing wired technologies of instrumentation with field wireless technologies, but providing customers with optimum solutions by combining the field wireless technologies with existing wired digital instrumentation and IT technology, to respond to the reliability and cost requirements of customers. 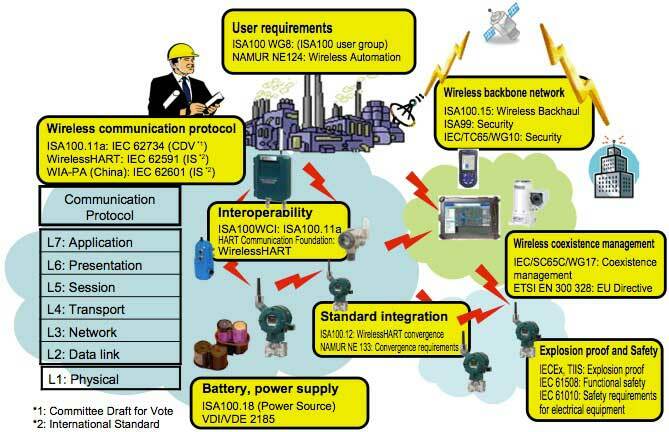 Yokogawa launched products for a highly reliable large scale plant wide field wireless system based on the ISA100.11a standard in July 2012. These products constitute the latest platform for achieving the above mentioned field digital innovations. For the technical details of these products, please refer to the respective papers compiled in this Yokogawa Technical Report. Figure 7 illustrates the structure of the field wireless system which is classified into four layers, i.e., field wireless device, wireless network, control/monitoring, and solution. Summaries of the technical requirements and relevant technologies of each layer are also shown. Most of those in the field device layer and wireless network layer in this figure are covered by the ISA100.11a technologies. The robustness, reliability, flexibility and expandability in these two lower layers ensure the offer of added value to satisfy a wide range of customer demands in the higher levels of the control/monitoring layer and the solution layer. For research and development in the control and monitoring layer, Yokogawa attained the results of research on a PID control algorithm shown in Figure 8 in 2006, which compensates for packet losses in a wireless network system4. This technology achieves a stable control even when a packet loss occurs during wireless communications, and this helps wireless technologies be used in a wider range of applications. Yokogawa has been engaged in the incubation of technologies required for field wireless control from the early stages, although this algorithm has not yet been implemented into our products. 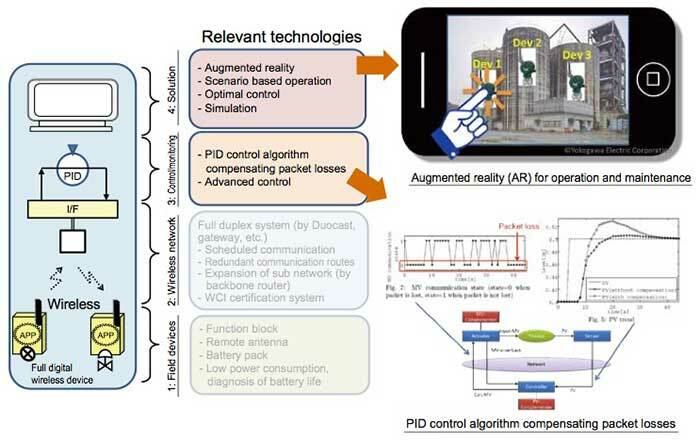 As for the solution layer, Yokogawa's research and development department has been working on the augmented reality (AR) technology as shown in Figure 8. This provides customers with new added value which they can innovate in their field operations by combining IT and field wireless technologies. For example, it can provide solutions such as for field operation assistance and safety management by showing wireless network connection conditions or standard operation procedure (SOP), describing the setup steps of a field device. To increase global competitiveness, keep up global environmental conservation, and secure safety in plant operations, field wireless technology is expected to provide customers with innovative solutions, resolving the problems which they have been unable to solve with conventional wired instrumentation. With a vision of field digital solutions, Yokogawa, is committed to the research and development of field wireless technologies and products with reliability, openness, and flexible expandability, applying the ISA100.11a standard from the user's point of view. The field wireless is not limited to replacing wiring, but can be a platform providing solutions, such as for abstraction, visualization and decision making assistance of the information, which can add high value to the data collected in the fields. On top of this, Yokogawa will develop field digital innovations by integrating wired instrumentation systems with IT and making them work together, thus solving customers' problems. The sources of ideas for solutions can be found at operations sites, and potentially useful applications unique to wireless systems and beyond our imagination may be latent there. Therefore, Yokogawa, as a solution company, will openheartedly listen to customers' opinions and strive to solve on site problems, keeping in mind that an industrial site is a treasure trove of solutions. FOUNDATION fieldbus and HART are registered trademarks of the Fieldbus Foundation™ and HART Communication Foundation, respctively. Other brand names in this paper are the trademarks or registered trademarks of each company.